Year over year growth is something that all companies are looking to achieve, whether you work for a large established enterprise or an eager upstart. But marketing and sales may not be aligned on the same path to get to that end. By incorporating predictive analytics into the mix, you can identify the right targets, plan the right strategy and get sales focused on the right opportunities. marketing database. Just like traditional lead scoring, predictive marketing ranks your leads and accounts with fit and behavioral attributes. But unlike traditional lead scoring, predictive can identify external buying signals such as the number of job postings, amount of revenue growth, new executives, etc. 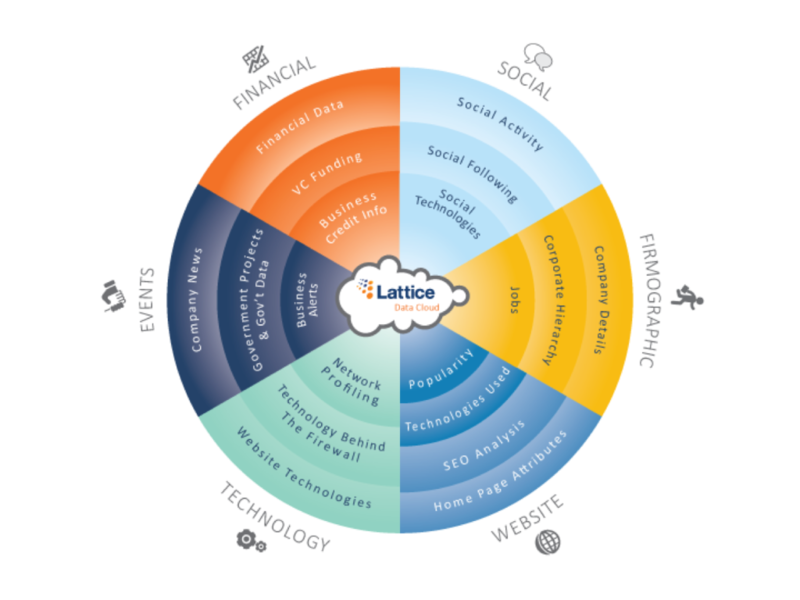 Lattice helps fill this gap with insights from the Lattice Data Cloud. With over 35 data partnerships and scanning more than 100 million websites, we have data on over 150 million businesses. Our Data Cloud covers financial, social media, firmographic, website, technology, and news sources. 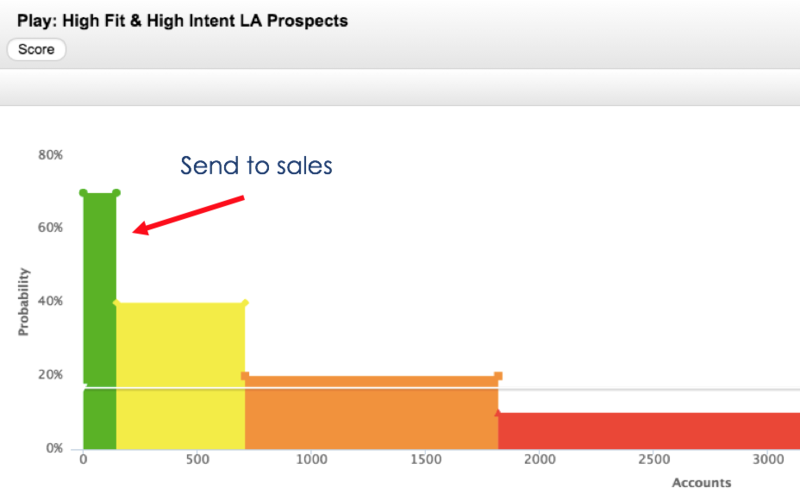 If you have been following the predictive space, you may have heard about intent data. In short, intent data is collected via cookies from search engines, communities, media sites, blogs, forums, etc. about a web user that make show some intention or future action. Take a look at this short video to learn more about intent data. Once you have an understanding of your best target accounts, you can use vendors like InsideView, Hoovers, RainKing or ZoomInfo to identify the right titles, get relevant contacts or keep your contact details fresh. In addition to uncover the right leads and accounts, predictive can also power smart campaign planning. By having a clear picture of your top predictive attributes, you can create richer personas to guide your messaging and copy. 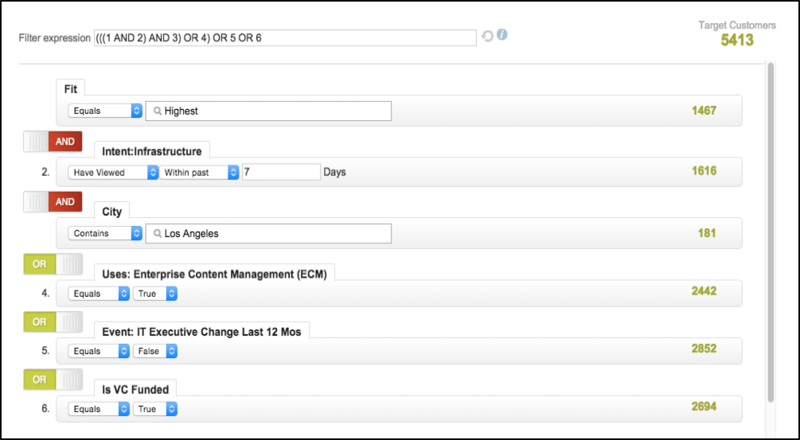 Predictive can help you segment and create targeted lists based on fit, intent and transactional data. From there, you can send the best leads and accounts directly to sales to ensure they are focusing on the highest potential targets and execute the best marketing outreach campaigns to those leads and accounts that aren’t ready yet. Predictive isn’t just for managing your existing database. As new visitors fill out forms on your site, predictive marketing can determine that lead’s score as soon as it engages with you. This allows you to auto-qualify lead for sales in real-time. With predictive in place, you can be rest assured that sales is focusing its time and effort on the highest scoring leads. But in order for predictive to have a major impact on the bottom line, it must be actionable. Consider passing your predictive attributes to your sales team so they can see exactly why the leads and accounts are high potential targets. Take it a step further and develop talking points, tips, hints and best practices so sales can have the most engaging conversations with prospects. If you are ready to learn more, we are participating in Demand Gen Report’s Strategy & Planning Series to help marketers get on the right path for 2016. 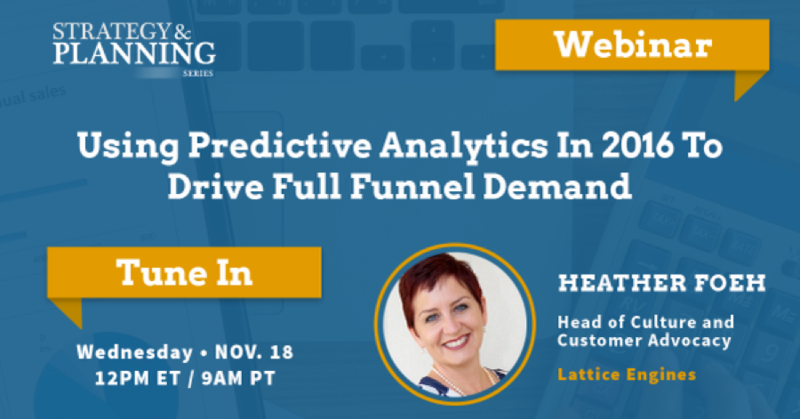 Join our webinar with Heather Foeh, head of culture and customer advocacy, and Carol Krol, editor-in-chief of Demand Gen Report, on November 18.